Listen, we love the men in our lives. But we also know that—from time to time—they can be a wee bit sartorially challenged. Anyone who’s ever dated a man who, for some reason or another, found it appropriate to wear flip-flops in a public, non-beach zone understands this fact thoroughly. But we’ll give them credit—men’s fashion can be a challenging world to navigate, in part because, on the surface, there don’t seem to be a ton of options from which to choose. But this just isn’t true; guys have a slew of choices when it comes to their style. And we’re here to help. Scroll down for 15 things you should never let your man wear, plus 30 stylish alternatives to shop now. Your guy might put up a fight when you tell him he has to sacrifice is long-beloved, huge, pocketed friends. But this is a battle that you must start, and you must win. 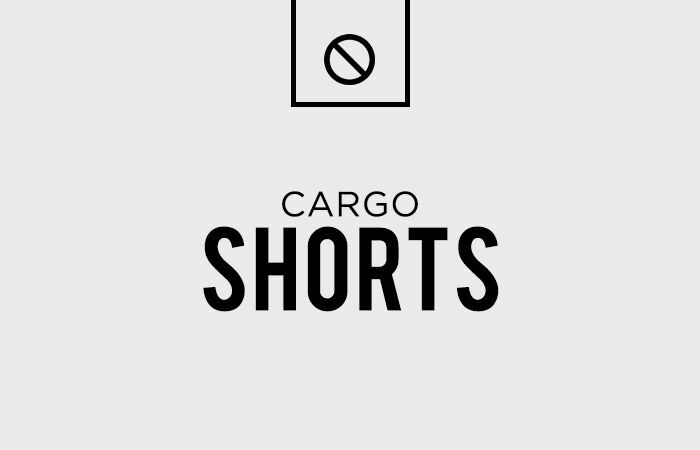 The cargo shorts must go. Try instead: A pair of well-fitting chino shorts for work or play. We love a classic pair of chinos. If subtlety's not really your man's strong suit, go with these. This should just never happen. Water proof for all types of weather. Dear boy: it's cool if we borrow this, right? A stylish man would never be caught out and about wearing flip-flops. There are only two places where the casual sandal is acceptable: inside the house and at the beach. Otherwise, no. Try instead: A chic pair of sandals. Try a pair of classic Birkenstocks instead. Edgy and casual, at the same damn time. There’s something so very sad about a man in a suit that doesn’t fit. A suit should be comfortable, have a slim fit, and make your man look sexier than he’s ever looked. Trust us, it’s worth the investment. Try instead: A streamlined suit, preferably one that's cut-to-fit. We dare you to find a man who wouldn't look amazing in this suit. We dare you. The lighter grey wash of this suit is easy to dress up or down. Past the age of, say, 20, a man should not be wearing ironic T-shirts. A woman can only take so many sartorial references to juvenile catch phrases du jour. Try instead: A cute T-shirt in a wistful print. Every man needs a BOO T-shirt in his closet. We can all thank Pharrell for making short-sleeved button-ups a legitimate thing. Unless your man is actively on a field kicking a ball around, he should not be wearing a jersey. No, not even when the [insert favorite team here] are playing. Try instead: A sporty polo. The slimmer cut of this polo makes sure he cleans up well. A crisp white polo is a must in every stylish man's wardrobe. Unless his last name is Depp or Carter, your man should not be wearing necklaces of any sort. Try instead: A masculine cuff or a nice watch. We love this subtle leather cuff. There's a reason everyone is wearing this cuff. Because it rules. There is perhaps nothing worse than a man in jeans slung so low his underwear is showing. And we didn’t need Cher Horowitz to tell us so. Try instead: A pair of perfectly-fitting jeans in a distressed wash. When a man's denim game is strong, there's not much else you need. These skinnies are just the right amount of tight. Only mob bosses and drug lords should be wearing pinky rings. If your man is either of these things, you’ve got bigger problems than bad jewelry choices. Try instead: Cologne, nothing at all, or a very subtle bracelet. How cool is this cuff? We want to borrow this one, too. A classic silver cuff is a necessity. The slightly cooler cousin of saggy jeans is the too-tight pair of skinny jeans. Except the too-tight skinny jeans are almost worse, because they make your man look like he’s trying way too hard. Try instead: A pair of skinnies that actually fit appropriately. Trust us, you'll love your man in these white jeans. The other side of the coin: every man needs a solid pair of black skinny jeans hanging in his closet at all times. Unless he’s out in the woods, doing manly things like chopping wood, a man should never wear overalls. We literally cannot think of one occasion when they would be appropriate—because there isn’t one. Try instead: A pair of wear-them-forever jeans. The slightly shimmery finish to these jeans will look even better after a couple washes. Normally, we'd vote against colored denim for men, but there's something alluring about these. This is a rather tricky, albeit in vogue, lady trend as of late—but on dudes it just reads more normcore and, frankly, it's not cute. Try instead: A pair of casual (but stylish) sneakers. Man's best friend: a classic pair of Chuck Taylors. We love the print on these guys. Steve Urkel. Chandler Bing. Need we say more? Try instead: A classic sweater great for all occasions. This sweater is the perfect opportunity to teach your man that mustard isn't just a condiment. A great heather gray sweater is such a stylish wardrobe staple. A thick necktie is abominable—it makes a man look older than he is, and incredibly outdated. It’s all about the skinny tie—they look sleek, sharp, and modern. Try instead: A skinny tie in a daring color or print. The oxblood shade of this tie is just gorgeous. You can't go wrong with a plaid tie, guys. Glasses with transition lenses are perhaps your man’s quickest route to looking way older and (less cool) than he actually is. And no, their practicality doesn’t make up for their general terribleness. Try instead: A classic pair of sunnies or a cute pair of spectacles. An iconic set of clubmasters: yes, yes, yes. Nerdy chic, here you come! This post was originally published at an earlier date and has since been updated. Up next, what not to wear on a winter date.